Graduation Range Dial Reading Length In. (mm) Ball Dia. In. (mm) Description Dial Color Order No. Order No. 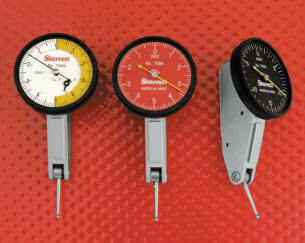 These precision test indicators were designed to be positioned for easy and accurate readability. The versatility of the angled head, combined with the three dovetail mounts eliminates the need for having both vertical and horizontal style test indicators. These are the features that make this series of test indicators superior to ordinary types. Indicators are furnished in a deluxe fitted case.